I’ve always been intrigued by photos of flowers on pure black backgrounds, so last summer, I decided to do some black box photography, using an abundance of mountain wildflowers blooming around our Montana homestead as subjects. I began by making a box that had four sides: right, left, top and back (no front or bottom) that was 24” high by 15” wide by 17” in depth, using black foam core. The two pieces that would form the sides were each 17″x24″, the back piece was 24″x15″ and the top piece was 17″x15″. 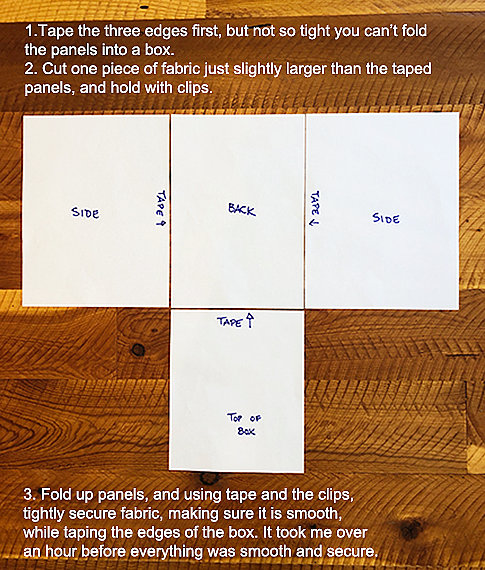 I placed the four foam core panels in position so they’d form a box when they were folded together and cut one piece of fabric (that looked like a fat “T”) to just an inch or so longer than the four pieces. Using large binder (foldover) clips to hold the fabric in place, I tightened it by using the clips as extra “hands” until I could fold the fabric over the edges of the panels and tape them tightly in place to avoid wrinkles which could reflect light. I then folded the panels and taped them together to make the box. Once that was finished, I cut another piece of fabric to the size of the “floor” of the box and taped that in place. The bottom of the box is a separate piece the same size as the top (17″x15″)and can be pulled out if necessary. SIDE PANELS are 17×24 inches. BACK PANEL is 15×24 inches. TOP PANEL is: 15×17 inches. I used black duct tape (although black gaffers tape may be easier to use), to make sure no light got through. Only one yard of black, flocked, upholstery velvet fabric was required for the size of the box I constructed and I found it on Amazon for less than $10/square yard. (see Resources below). Do NOT use crushed velvet as it will reflect light. A lint roller is also important to have on hand, as this velvet fabric is a magnet for lint and pet hair. By the time I finished making the box, I needed a flashlight to see inside it– it was pure black. The box sits on a table, with the opening at a 90-degree angle to the window, with space on the table for my tabletop tripod. I usually put my flowers in a short vase which goes inside the box. The nice thing about the black box flower photography, is that you can shoot flowers all year round. During winter I get them at a local supermarket or from a florist. I’ve found that flowers with lines, curves, large petals and textures photograph best. To get the best results, I underexpose the image to retain maximum detail, while utilizing natural light from a nearby window to highlight the curves and petals. Spraying a bit of mist onto the flowers can also add to their overall appearance. Some items you’ll find useful. 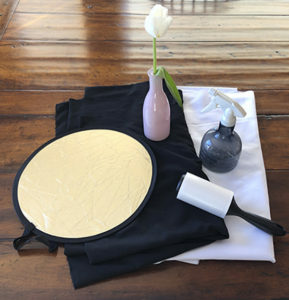 Small reflector, vase, spray bottle, diffusing cloths and lint roller, Photo © Christie Pentecost. My camera is a Nikon D850 (full frame) with a 105mm f2/8 lens; however, any lens that lets you shoot close will work. You’ll also need a tripod, due to the long exposure times that are required. I use a Platypod (see Resources below), which is extremely stable. Camera settings vary, depending on the ambient light and the color of the flower, but I always shoot on manual at an ISO of 100 though, of course, that, too, can vary. My f-stop is usually around f/9, for two seconds with minus two (–2) exposure compensation when I start out, but that frequently changes as I experiment to get the best image. I underexpose because it’s easier to retain the details and shadows in the flowers and if the image is even slightly over exposed, that detail is gone, and can’t be brought back. I also set my camera to Live Mode, which makes it easier to see my subject. A remote or external shutter release is also recommended to prevent camera shake or, as an alternative, you can use the self-timer. Camera and black box setup is very simple and the entire rig can fit on a table top. Start with a window-to-box distance of about 3 feet. Photo © Christine Pentecost. Since I’m using natural light from the window, I use various diffusers to either darken the flower, or to bring in more light. The items I use the most are a piece of white sheer fabric, a piece of black sheer fabric, and a 12” round reflector, silver on one side and gold on the other. When it’s a sunny day, especially with snow on the ground outside the window, I get a lot more light than I want, and have to work to diffuse it. On a cloudy day, I may need to pop up the light. Of course, changing the camera settings such as using a longer exposure times or larger apertures may also help. My objective is to naturally highlight the unique parts of the flower, while maintaining the shadows and details so as to bring out the flower’s layers and textures. I will play around with the angle of the flower until I feel it has the best visual appearance to draw in the eye. Sometimes, it’s the center of the flower; other times it’s the curve or texture of the petal. I may change the vase or holder I’m using, to get a different angle. I’ve even used a binder clip, stuck in clay, to hold the flower at the angle I want. Sometimes I’ll spread out the petals, or pull off petals, to create a unique look. Only the back petals of this image are in focus because at close distances, even when using small apertures, depth-of-field is too limited to get every detail sharp from front to back. Photo © Christine Pentecost. Once I get the flower positioned and the lighting right, I’ll begin taking photos, varying the settings, until I get an image I like. And while I tend to underexpose the image, I don’t want it so underexposed that I can’t see the flower. Because I’m shooting really close-up, my depth of field is going to be very narrow, even when using a small aperture. Not to worry. 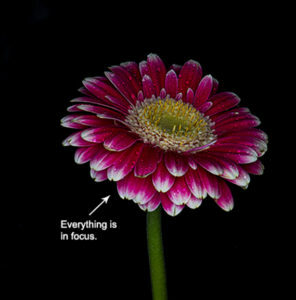 If I want the entire flower to be in focus, I can use a simple technique called “focus stacking”. Using focus stacking, the entire image is now in focus. This digital technique bypasses the laws of optics and is a great tool available for macro photographers. Photo © Christine Pentecost. I’ll focus on two to three (or more) areas of the flower, from front to middle to rear and then use Photoshop CC to blend only the in-focus areas together so I end up with a completely sharp image. There’s an excellent program that does this automatically with just a few clicks called Helicon Focus (see Resources below). Finally, I move onto post-processing. This is where everyone has creative license to make adjustments– there are no set rules. The main thing is to make sure that whatever changes you make, a pure black background is maintained. Check your histogram frequently to confirm this. When I’m satisfied with all of my post processing edits, I print the photos using my favorite photo papers for this type of photography– Red River Polar Gloss Metallic or UltraPro Gloss. If I decide to frame the images, I use a museum grade non-glare glass. While I use black box photography for flowers, it can also can be used to showcase ceramics, models, toys, small sculptures and other inanimate objects. Give it a try and I’m sure you’ll be as delighted with the results as I’ve been. Home on the range. Drone photo © Christine Pentecost. Christine Pentecost is a Red River Pro and frequent contributor to the Blog. 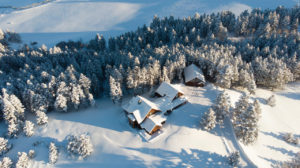 She lives with her husband, cats and other assorted outdoor critters like bears, elk, deer and mountain lions on a homestead near Bozeman, Montana. As you can see from one of her recent drone photos, she has looong winters and plenty of time indoors to pursue black box photography. 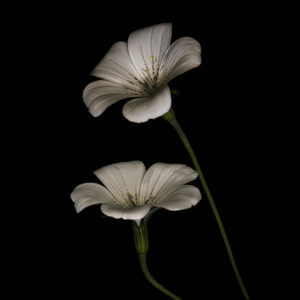 Visit Christine’s website and enjoy more of her black box flower portraits. Here’s where you get the black velvet. Check out the Helicon Focus app. Learn about the Platypod tripod. 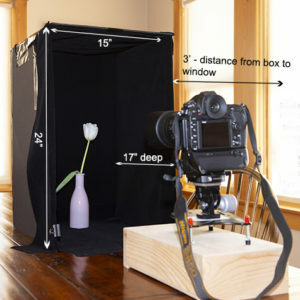 For tutorials and videos, Google: Black Box Flower Photography Techniques. Find out more about Red River Polar Gloss Metallic and UltraPro Gloss papers that Christine uses to print her black box flower images. Take Great Holiday Party Photos! When out in the field I’ve used Scott Kelby’s suggestion to substitute a black jacket or piece of fabric as a backdrop for wildflowers or whatever else you want to photograph. The effect may not be quite as dramatic as a black box since you can’t control every aspect of nature but I’ve been pleased with the results. I’m wondering if one of the e-bay photo booths may be a quicker way to construct the box? Use flat black spray paint on the surfaces? Has anyone tried that? 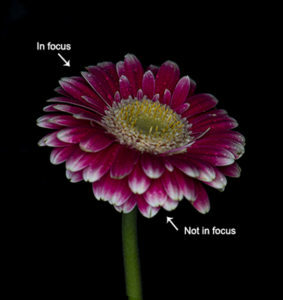 I get the same effect using twin strobes 4 or 5 inches from the flower, shooting at f22. Because the strobes are so close, light fall off results in a similar black background and the quantity of light allows for f22 and max depth of field.